Ergonomic barbell pad design for even weight distribution across the shoulders, relieving neck pressure while squatting. The Advanced Squat Pad allows you to focus on your form without pain. Our 17.72″x3.94″ pad will fit comfortably in your gym bag, and more importantly on any barbell, standard or Olympic sized. Whether your goals are strength, health and fitness or just purely aesthetic, let us help you achieve them, and do it in comfort. This item is designed with high-density thick foam, and fits firmly on the bar and does not move side to side. Thick, high density, non-slip rubber-foam squat sponge absorbs impact and reduces pain. Quickly install or remove the Barbell pad in the blink of an eye, but remains securely fastened during lifts, allow you to perform the heaviest squats in comfort. Our Barbell Squat Pad reduces discomfort to allow you to workout longer, and with more weight- increasing your gains! Anti-Slip matte finish to reduce risk of slippage and increase grip on the shoulders. Quick-Slip design for easy and fast installation on any barbell. Fits any bar without movement. 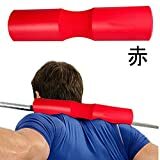 Just clip the bar pad on the bar and start exercising. 1. Good quality and competitive price. 2. Elegent looking and comfortable usage. 3. Widely used. Convenient slip on design, suitable for use with virtually all barbells. 4. Reduce the pressure on your back and shoulders when performing heavy squat sets. .
5. Designed for function fit and comfort.